Arriving back from holiday, I found an email from Sofa Cinema, the Guardian’s film rental site. My rental experience was about to ascend to the next level, they informed me, and from 16 August I would be taken to a ‘new look’ website. I would enjoy many improvements and there would be nothing more to pay. My immediate reaction was to wonder why the Guardian felt it needed to redesign Sofa Cinema. I signed up for the service in 2008 and the site always seemed a model of its kind: clearly laid out, easy to use and effortlessly elegant, while looking like it was an integral part of the Guardian empire. I understood that guardian.co.uk was in partnership with the lovefilm.com rental site and that Sofa Cinema users benefited from Love Film’s stock of around 70,000 titles, but I liked the Sofa Cinema front end and, yes, it did make it feel like a more stylish kind of operation. I admit this was brand allegiance – no sniggering. 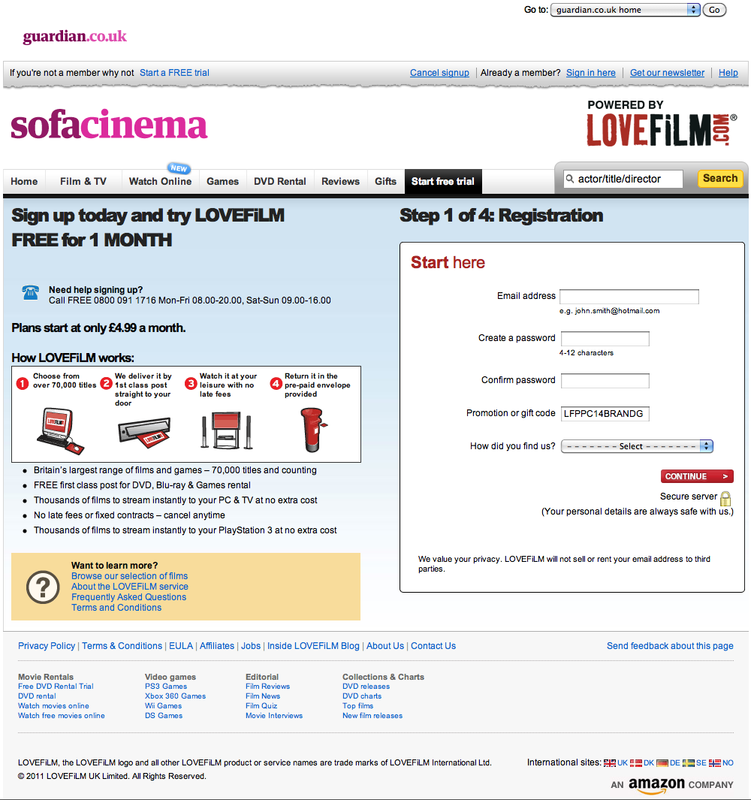 Entering the standard Sofa Cinema URL produced a screen that said the service was now part of the Love Film family – meaning what? – and I would be redirected to the Love Film site. So there was no Sofa Cinema redesign. They still have the guardian.co.uk and Sofa Cinema branding at the top, opposite the Love Film logo, but everything else is Love Film. This left me with the queasy feeling you get when an insurance company or a mortgage lender abruptly informs you in the post that the company is now owned by someone else – possibly even an outfit to which you chose not to give your business in the first place. The Guardian branding and the ‘powered by’ come-on is purely cosmetic, something that only appears on the Love Film site once you enter your password and it recognises you as a Sofa Cinema customer, or if you arrive at the site via one of the Guardian URLs. So far as I can tell, the Guardian has effectively washed its hands of Sofa Cinema and the commitment to maintain and develop its own rental website. I would have called it a day there and then if I hadn’t been in the grip of a film habit that still needed to be slaked, and if it hadn’t turned out that I could switch to a rental package that suited me better for slightly less money. I might love film, but loving Love Film is something I will have to work at. On the positive side, the site is loaded with content and has many features that Sofa Cinema lacked – not that I was looking for them. It was always possible with Sofa Cinema to leave star ratings and reviews. Love Film provides a more detailed breakdown of this aggregated info for anyone who needs to know how many people thought Last Year at Marienbad merited only half a star out of five. It’s also possible to register and give other members access to your entire list of films rented, reviewed and rated, if they can be bothered. In addition, Love Film’s editors provide a stream of reviews, news, interviews, lists and recommendations. While it isn’t hard to find your way around, Love Film lacks the virtues that made Sofa Cinema so attractive – its clarity and elegance. It feels like a site where extra features have been slapped on over time, with no one paying close attention to the architecture, consistency and character of the whole. There are too many boxes, and boxes within boxes, and panels demanding a response with a barrage of mismatched colours, and headings in a jumble of type styles and sizes. There are sections with miniscule type stretched over long-distance line lengths that barely look like a typographer has been near them. Some of the editorial material pops up in two different formats depending on which direction you approach it from. The rental list, the one part of the site that can’t be avoided even if you ignore everything else, is another needlessly fussy nest of boxes and rules, and the columns for rating a film high, medium or low priority are tricked out in a mishmash of peculiar colours. Again, it doesn’t look fully designed; it’s usable enough, but it could be so much better. If Love Film has a visual image at all, then it is a plain and minimally finessed mass-market style (even the unsubtle tabloid style can still be executed with flair). I’ll continue to use it, but without feeling much loyalty. For this Guardian reader, the ‘new look’ Sofa Cinema is not the paper’s finest hour.